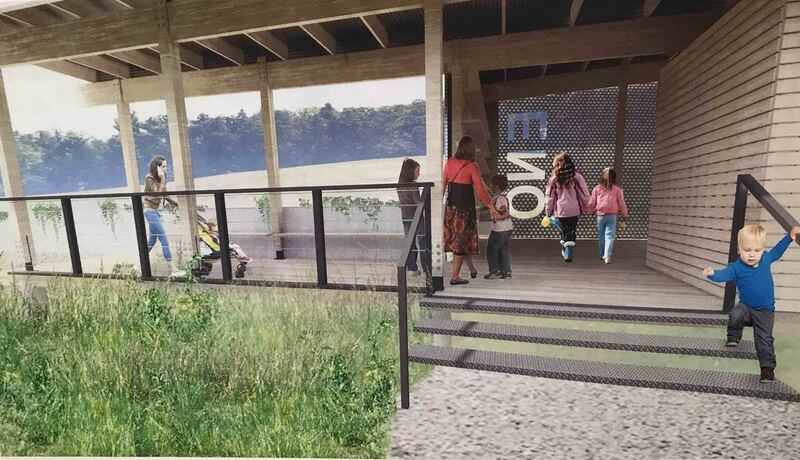 Environmental Education Pavilion coming to West Point on the Eno this summer! West Point on the Eno has been selected as the site for this year’s 2018 NC State Design Build Summer Studio. This is the third such project in Durham over the last nine years. 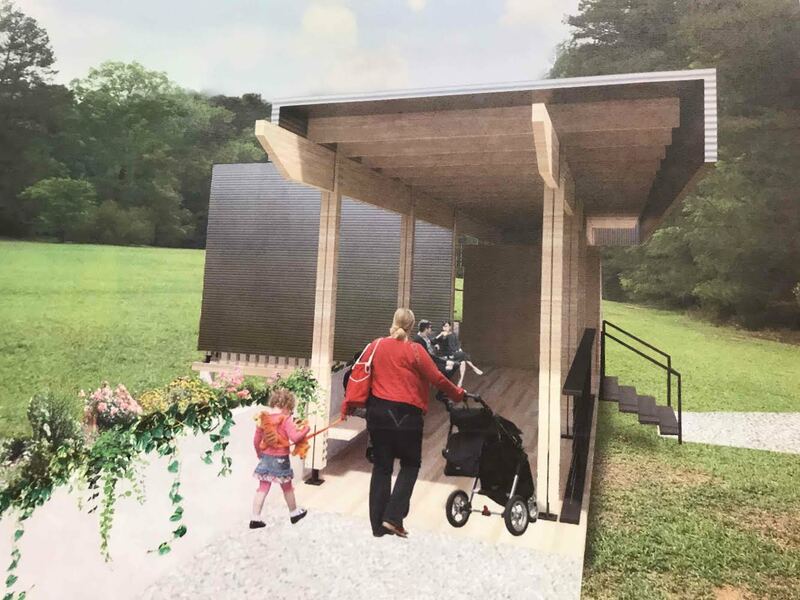 Students from NC State’s College of Design (School of Architecture) will design and construct an Environmental Education Pavilion at the West Point on the Eno for all of Durham to use - in just 11 weeks! The instructor group includes Randall Lanou (BuildSense), Erik Mehlman (BuildSense), Scott Metheny (Architrave), and Ellen Cassilly (Ellen Cassilly Architect). This unique partnership will build a facility that will activate an underutilized section of the West Point Park, allowing staff to add programming and to expand conservation efforts. 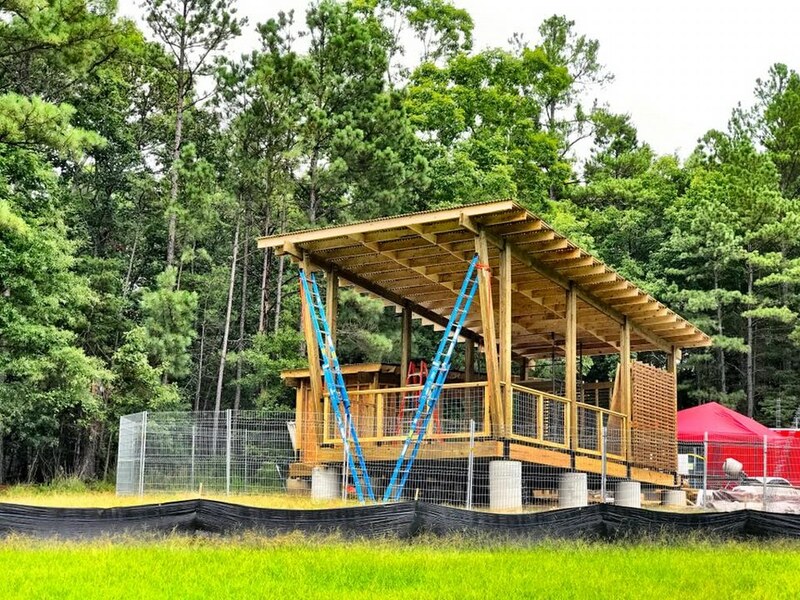 NC State students perform all of the work to complete the project in an intensive design-build course. In the end, they will deliver a $100,000 facility to the citizens of Durham. 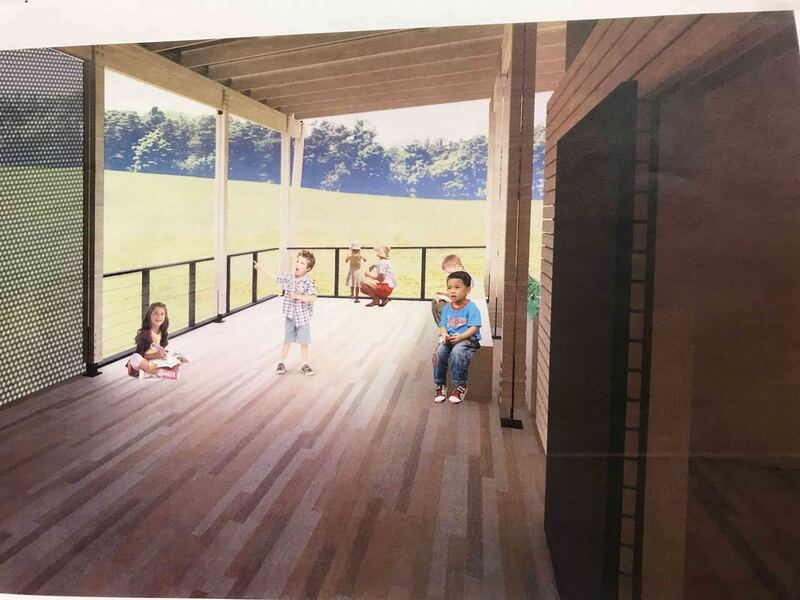 The Durham Parks Foundation needs your support to raise the $40,000 needed to purchase materials for this project. You can help DPF to reach this goal by becoming a Member or a Corporate Partner of the Durham Parks Foundation. ALL inaugural Members and Partners will be commemorated at the Environmental Education Pavilion, as well as on the DPF website. Learn more about Membership and Partnership here. Ready to support the Durham Parks Foundation and the Pavilion? Click DONATE to join today: specify “Membership” in donation type. Your gift will support the West Point Pavilion project, and other high impact Parks projects in Durham. Want to learn more about the project? Keep reading! 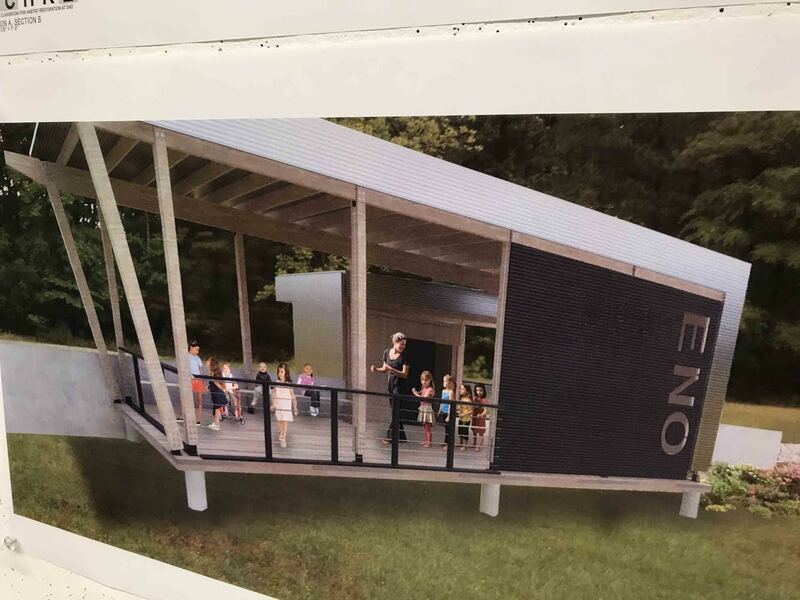 The new Pavilion will be situated on the northern portion of the West Point on the Eno Park, near the Amphitheater as shown below. 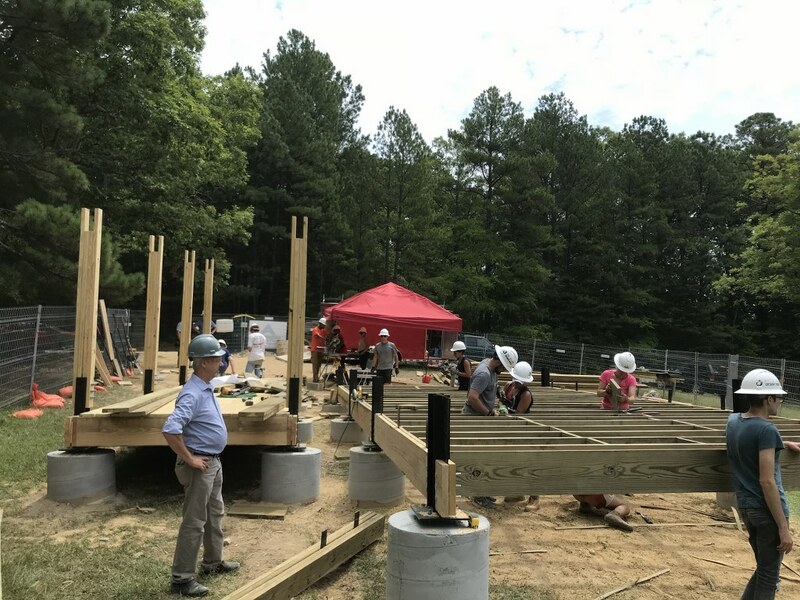 Students will begin designing the Pavilion on May 16th, and the construction will be completed by July 27 - that is just 10 weeks from start to finish! The specific design of the pavilion was developed by the students considering the location and planned program uses. And here are some renderings of what the finished structure will most probably look like. 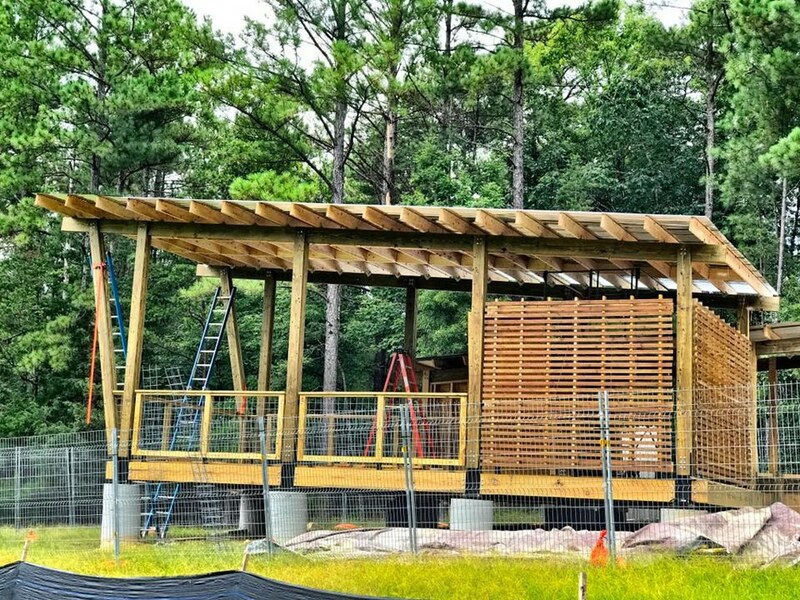 Environmental Education Pavilion takes shape. Please come by the site during the Festival for the Eno to watch the build in progress. We need your help to make this work, and to raise $40,000 to benefit all future West Point on the Eno visitors! Any and all donations are welcome and will be recognized on this web page and at the shelter site. “The Leaf” at Durham Central Park.